This is where the flexibility of our breakthrough design really comes through. 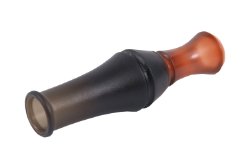 By squeezing, bending and releasing this duck call's soft body you can produce a full range of vocalizations. Mix up the sequences to achieve the flying squeal, the water whine or any sound in between.